The Final Report of the Inquiry was tabled in Parliament on 3rd October 2006. 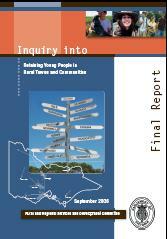 The Final Report is available in hardcopy and electronic formats. The media release that accompanied the report is available here. Hard copies of the Final Report are also available by contacting the Committee office on 1300 787 202 (Victoria only) or 03 9651 3580 or by emailing rrc@parliament.vic.gov.au. Alternatively, copies may be purchased from Information Victoria (external link). To view or print the pdf document, you will require the Adobe Acrobat® PDF Reader, which can be downloaded free of charge from Adobe. The Government Response to the report of the Inquiry into Retaining Young People in Rural Towns and Communities was tabled on 17 April 2007. Hard copies of the Government Response may be obtained from the Legislative Assembly Papers Office, Parliament of Victoria (subject to availability). Contact the Papers Office on (03) 9651 8563.